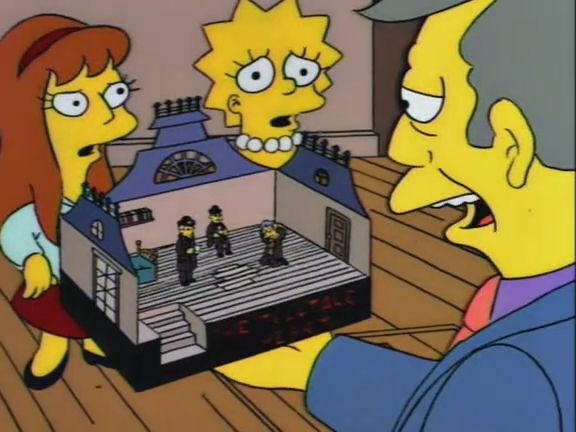 But on the first ever “Treehouse of Horror” from 1990--the Simpsons’ recurring Halloween episode--they adapted Poe’s “The Raven” more faithfully than any bit of lit found in any other episode. The poem, read by James Earl Jones, remains intact, more or less, but with Dan Castellaneta’s Homer Simpson providing the unnamed narrator’s voice. Marge makes an appearance as the long departed Lenore, with hair so tall it needs an extra canvas to contain it in portrait. Maggie and Lisa are the censer-swinging seraphim, and Bart is the annoying raven that drives Homer insane. Castellaneta does a great job delivering Poe’s verse with conviction and humor, while keeping the character true to both Homer and Poe. It’s a balancing act harder than it sounds. Suffice it to say that this foray into Poe was good enough for several teachers guides (including this one from The New York Times) to suggest using the video in class. (We’d love to hear about this if you were a teacher or student who experienced this.) And it's the first and only time that Poe got co-writing credit on a Simpsons episode. I have been a fan of The Simpsons since the 90s. I quote them pretty much everyday, so when I was an undergrad, I was given the opportunity to teach a class for extra credit when I was studying literature. We were read Poe at the time and this very episode that I watched when I was 5/6 frightened and intrigued me so much that I became a fan of Poe. Naturally, I own this season (and several others) and so I taught a class based on this and it went over really well. Everyone enjoyed it and the discussion that followed was very lively. I have learned a lot about life, pop culture, and religion from The Sinpsons. I will always love them dearly. Mad Magazine did an illustrated version of “The Raven” in 1954. It used all the words, with Bill Elder supplying the hilarious illustrations. Ah, the good old days, when Mad was a literary magazine. I have always included this video when studying Poe in 1st year Intro to Literature survey courses. The humour makes it the material covered and the analysis more memorable, and the students can see the real impact of literature on pop culture, which in turn helps even those students who are only taking the class as a requirement (and not out of interest) to become more engaged with the course material. I come by it honestly. As you can see I’m a Simpson named Lenore and have a Raven tattooed on my neck.